One of the best tire replacement experiences!!! I found these on a competitors website at the same price but since I do most of my tire work at Walmart I decided to see if they had them in-stock. Luckily they did and at the same price! I have a busy schedule and hate showing up somewhere to find they don't carry what I need. I ordered these online and had them shipped to my doorstep for free! Took a few days. I loaded them up and took them to my go to Walmart. An hour later they were mounted, balanced, installed along with my oil changed and I'm good to go. One of the best tire replacement experiences I've had and will be my path on the next set. This is my second time buying this tire. For a few dollars more it is a nice upgrade compared to the Douglas tire. I have these installed on my Subaru Legacy. They perform on wet and dry pavement. They perform decent in the snow and ice, not awesome, but decent. Really good All-Season tire. Got them on Black Friday for $40 off! Can already feel much better grip on the road and the snow and ice. Would purchase these tire again. I recently purchased four of these for our Honda Accord, I had Wal-Mart service department put them on. They are on a call in basis, did not have to make an appointment. They had the car for about an hour and all taken care of. The car had a donut tire on it, they were nice enough to place the spare back in the trunk. 1. This tire brand can only be purchased at the store and not online according to the online listing. If the store stocks it, you can buy one tire. If it is out of stock, then you will have to look elsewhere. 2. Use the drop -down menu under "quantity" to change the quantity from "4" to "1"
whats the tread wear, temp and traction on this tire?? 1. Treadwear rating is 260, so the tread will wear out quickly. The tires that I had wore out within four years of driving 40,000 miles. 2. The treadwear rating is 260 so the tread will wear out pretty quickly. I drove 40,000 on them and the tread was close to 2/32" depth. is this a all season tires? 1. 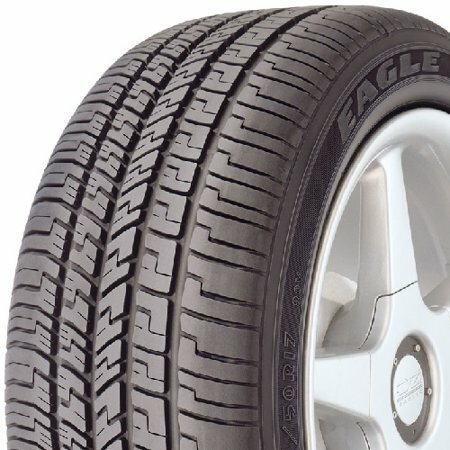 The Eagle RS-A is classified as an all season high performance tire. 2. Yes, this is a all season tire.